Jack London and Robert Louise Stevenson had something in common—something your children can also share with them. They both used copywork as a tool to improve their writing. A student copies a letter, word, sentence, or passage. Pretty simple. And because it is so simple we may think, “I’ll just skip it.” But though it may be simple in concept, even in execution for some, it is a powerful tool in teaching language skills. And an added bonus: you can use it with students of any age. Actually, as students get older, copywork can be even more effective. Copywork is a tool for teaching Language Arts naturally. Much like young children learn to speak through hearing and imitating the speech around them, young writers learn to write by copying the writing of others. In a way, they are imitating the sounds of written language. 1. Copywork teaches and reinforces language skills naturally. Copywork also reinforces skills your children have already learned, helping them see the skills used in context of real writing. When students learn rules apart from actual reading and writing, they often struggle to see how language is connected. 2. Copywork exercises learning muscles. How do you build up muscles? By exercising. And three components of effective exercise are repetition, consistency, and focus. So think of copywork like this: Through a regular routine of copywork, students encounter language skills repeatedly and in context of real writing. When we add consistency to a copywork regime they learn to focus. And when they are focused, they learn to pay attention to the details—a learning skill that goes beyond just Language Arts. Teaching Tip: If you have a student that has difficulty focusing, start small! Just like when we exercise the muscles, we gradually add weight, as your students exercise their learning muscles we gradually add to the amount we require. Charlotte Mason was a champion of short lessons for young learners to form the “habit of attention”—and from experience I can tell you, it works! Actually, your students’ first experience with copywork begins when they learn to write their letters. They look at the example of a letter and then write it. After this most basic form of copywork, they can then practice their handwriting by writing short phrases and sentences. Always focus on quality over quantity. Ask your students to give their very best handwriting effort. This isn’t the point to try to teach other skills. Instead, let them focus on neat handwriting only. Teaching Tip: If your child is having trouble with a particular letter, have them practice it before doing copywork. Then choose a sentence that includes that letter more than once. Tell your student to pay particular attention to writing it as neatly as possible. 2. To teach and reinforce spelling skills. You will be amazed how many words students will be able to spell correctly without ever teaching them specifically if you do copywork consistently. That doesn’t mean your students won’t be studying spelling in other ways. But the more ways we approach teaching any skill, the better our students learn it. Show a spelling pattern—example: “igh”, long vowel-consonant-silent e, etc. Follow a spelling rule— examples: “i before e, except after c, or when it sounds like a as in neighbor or weigh” or how to make a word plural. If you are a little rusty yourself, don’t worry! There are wonderful resources online to use such as Reading from Scratch—Spelling Rules. 3. To help students absorb language usage and rules. Copying good writing helps students to absorb the rules of grammar, punctuation, and mechanics in the same way. You’ve heard the phrase, “Children are sponges.” And it is so true when it comes to learning just about everything, whether we want them to or not. Teaching Tip: Sometimes authors break the rules for stylistic purposes, so for young learners choose passages that exemplify correct grammar, punctuation, usage, and mechanics. Need help? Check out The Purdue Online Writing Lab (OWL). You can learn right alongside your students—a wonderful benefit of homeschooling! 4. To grow your students’ vocabulary. Most people agree that one of the best ways to develop a great vocabulary is to read. Copywork is simply an extension of this idea. When children copy a sentence, they first read the words in context. Then they write the words they have read. Studying vocabulary as a part of copywork helps students notice the context clues to the meaning of unfamiliar words and shows how those words can be used in a sentence. Teaching Tip: Point out any words in the passage you think your children might not know and talk about the definitions before they do their copywork. Then after they complete it, ask your children if they can make up their own sentences using the words. 5. To see how writers structure and vary their sentences. Now listen. I vary the sentence length, and I create music. Music. The writing sings. It has a pleasant rhythm, a lilt, a harmony. I use short sentences. And I use sentences of medium length. And sometimes when I am certain the reader is rested, I will engage him with a sentence of considerable length, a sentence that burns with energy and builds with all the impetus of a crescendo, the roll of the drums, the crash of the cymbals–sounds that say listen to this, it is important. Go back and read that passage aloud to get the full effect. When your students copy passages, they can internalize how to structure sentences in a variety of ways. You can find examples of authors varying their sentence lengths, writing a mixture of simple and compound sentences, and beginning sentences in different ways from simple subjects to clauses. Students don’t have to know the technical terms for those things to see how real writers keep their writing interesting by adding variety. 6. To experience how literary elements and devices make writing more powerful. Beautiful imagery, metaphors, similes, alliteration and other musical devices make writing engaging and fun. They draw readers into an experience, helping them to “see” what a writer is trying to convey. When I was in school, I remember doing worksheets on these types of things, but I didn’t really make the connection between memorizing the definitions and writing my own, to using them in real writing. Copywork helps students make the connections. They aren’t having to come up with their own examples at first; they simply see writers using them effectively. Teaching Tip: After copying a passage that exemplifies a literary element, let them illustrate it. Or for fun, have them take a simile or metaphor and draw a picture of what it would look like if they took it literally. 7. To reinforce a writing concept they have learned. ‘Where’s Papa going with that ax?’ said Fern to her mother as they were setting the table for breakfast. I think most of us will agree, we want to keep reading and find out. You’ll notice how many times in the teaching tips I said to point out a particular word, technique, or concept before they do the copywork. I really believe you will find this to be an effective way to use copywork in teaching Language Arts skills. But know, if all your students do is copy a passage without any pre-teaching by you, they will still see many benefits simply through the concept of absorbing language naturally. When you are intentional though, you will be able to individualize language instruction for the unique needs of your children. 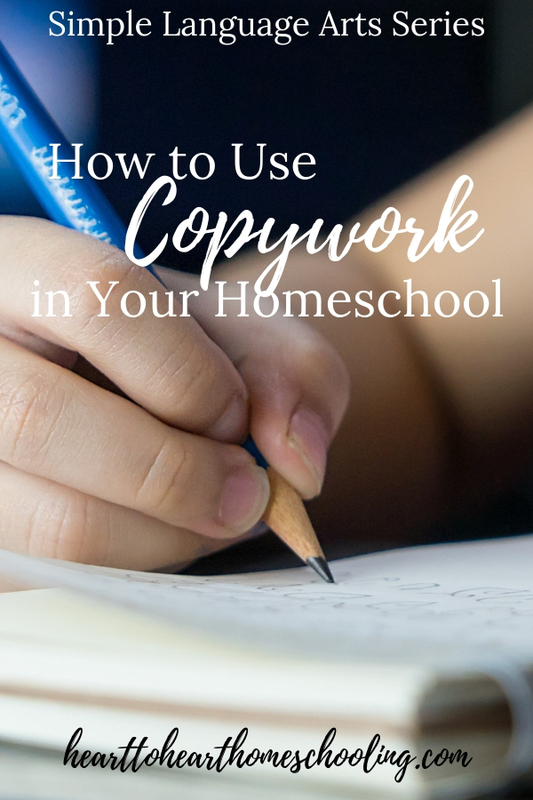 So let me encourage you: use copywork in your own homeschool. It is truly a powerful and effective tool in teaching Language Arts naturally. Do you love the idea of teaching Language Arts naturally, but need a little more direction? 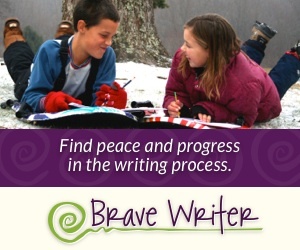 Brave Writer Language Arts Programs will provide you with all you need! I really like how you break down each point (including teaching tips). I have suggested to our teen that he copies out his notes (or even types them like I used to when I was in school) to help him study for his quizzes and tests. I will direct him to your blog to show him that there are others who make the same point as his stepmom. Ha! Yes, send him this way 🙂 Sometimes it takes hearing it from someone else. My son did a research paper about how taking notes by hand instead of on the computer helps us remember the information better. If he has the notes already written and then types them, I’m thinking it would reinforce it both ways.